To me, one of the most fascinating concepts to ponder in history is when you can pinpoint a historical event to an exact moment, an exact minute, in time. This gives an event a sense of immediacy – like, if I were there, witnessing the event unfold and looked at my watch, the time would be. . . . For the start of Wartime Prohibition in Lowell, Massachusetts, that exact moment was 11 PM on June 30, 1919. It was a warm and fair night – with temperatures in the low 60’s. As Lowellians and residents from surrounding towns thronged into Lowell to stock up on liquor (before its sale became illegal), Boston-minded Lowellians might have talked about the fare increase on Boston’s Elevated Railway (the L, as they called it, which was the predecessor to today’s MBTA), to a full dime – up from the current per-ride rate of seven cents a ride, and its nickel fare one year before. Those excited for the approaching Independence Day spoke of surprising explosiveness of the year’s stock of fireworks, and how the high-grade powder created for the munitions for the War may have influenced this. Still others spoke of the dealers hawking the summer’s first watermelons at their street stands and how they were skirting regulations by exposing cut melons at their stands to the dust and germs of the streets. The more internationally-minded in Lowell that night might have spoken about Eamon de Valera’s visit to Fenway Park the night before. Of the 60,000 people who crowded into Fenway Park to hear the provisional president of the Irish Republic speak, it was estimated that at least 1,600 were from Lowell. On that June night in Lowell, most were probably talking of Wartime Prohibition, speculating that it wasn’t expected to last. Congress had passed the Act that created it, intending to conserve grain for the World War I war effort, on November 18, 1918, a full week after the armistice that ended the Great War was signed. The Prohibition was still honored, however, because the demobilization of the troops had not yet been effected by President Woodrow Wilson by the effective date of the Act, July 1, 1919, also known as the “Thirsty-First” of June. All that was needed to suspend the Act, people reasoned, was the proclamation from President Wilson demobilizing the troops. Surely, some speculated, that proclamation would have to come on July 15 or August 1, or September 1; the most pessimistic named dates slightly later. On the eve of the “Thirsty-First” of June, Lowell residents were not only predicting the date of the end of Wartime Prohibition, they were also predicting what would happen to city’s many liquor stores, and if they would ever replace the inventories that they were just then cleaning out. Some predicted an onslaught of carpenters, workmen, and movers to arrive in Lowell on the morning of July 1, ready to remove and deconstruct the city’s bars and liquor stores, replacing placards advertising liquor with “To Let” signs. Others predicted that Prohibition would be only temporary, and that the liquor stores would close temporarily, or operate for a time in other businesses. In the end, Wartime Prohibition was replaced with an even stricter Prohibition, that further restricted laws around the sale and possession of alcohol; the related Volstead Act set the penalties for violating them. Prohibition, as it turned out, proved to be too much for Lowell-area liquor dealers. In 1915, there were 15 city merchants selling ales, wines, and liquors that were successful enough to place advertisements in that year’s Lowell City Directory. Seven years later, by 1922, only three remained, as ‘beverage’ sellers; not one of those took out a directory advertisement. One of those merchants, P. Dempsey & Company Liquors, located in Lowell’s downtown area on Market Street, had origins in Lowell that dated to 1846, when it closed during Prohibition. The shop sold the “finest orange bitters”, creme de menthe, vermouth, and even Fisher Rye, the “Finest High Ball Whiskey in America”. Its advertisements appear on each side of this paragraph, 1915 at left; 1880, below. The Downtown Lowell landmark had closed by 1922, its location vacant. 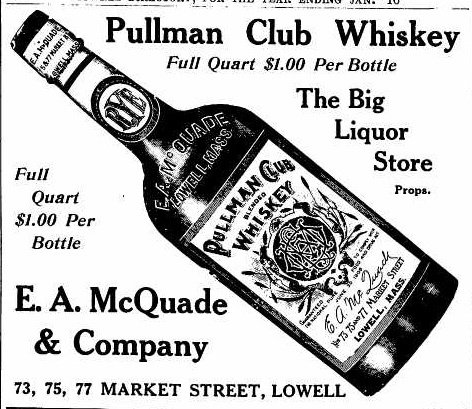 E. A. McQuade, another prominent Downtown Lowell merchant and the exclusive dealer of Pullman Club whiskey, had a successful enterprise located at 73-77 Market Street in Lowell in 1915, which was well-known locally as “The Big Liquor Store”. 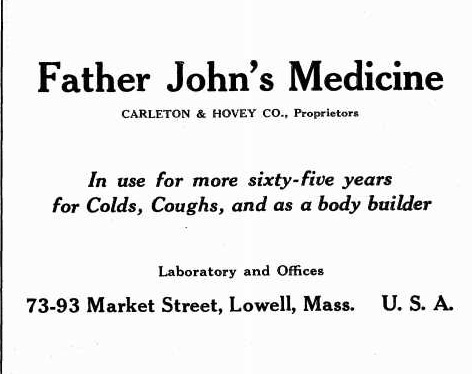 By 1922, his business had closed and the location then housed Carleton & Hovey Medicine, which sold the famous Father John’s Medicine. Another successful liquor store, Peter H. Donohoe & Co., located at 40 Church Street, sold wines, brandies, and whiskies to Lowell clientele until Prohibition. 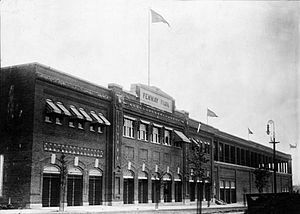 By 1922, its doors had closed. The Church Street location was taken over by an electrical contractor. On the eve of the “Thirsty-First” in Lowell, its residents and visitors likely could not have envisioned the sweeping changes that Prohibition would bring to their city, which included the changing of storefronts. The changing of those storefronts presaged another more serious, and unanticipated, effect of Prohibition – an increase in the illegal production of alcohol, i.e., moonshine. But, there’s enough information in that topic to justify saving it for a future post.